After a morning ripping waves, you’re starved. Gliding up Kamehameha Highway, trolling for food, your eyes are riveted to to a lunch wagon parked on the roadside. It’s painted with a sunset,and a five-foot-long shrimp cutout is plastered on the side. 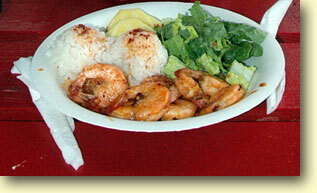 The aroma of garlic shrimp scampi is so intoxicating, you pull over to join the chowhounds at Fumi’s Kahuku Shrimp truck . 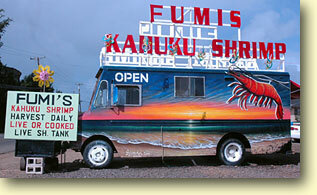 Fumi’s is one of an estimated fifteen shrimp trucks that set up shop along the north shore. What makes the area so appealing to seafood junkies is the vast number of shrimp ponds producing the giant, succulent sea creatures typically 3 to 4 inches. You park your car and trudge through the gravel. As island reggae wafts through the air, you sit down at a red picnic table, flipping through the menu with photos of Fumi’s twelve different shrimp entrees-all served take-out style on a paper plate with two scoops of rice, salad, and two pieces of pineapple. Expect to shell out between $10 to $12 per entrée for coconut shrimp, lemon pepper shrimp, butter garlic shrimp, tempera shrimp and other delectable dishes that usually arrive with a dozen shrimp piled in a heap. Sweet Kahuku corn is a must-order for only $1 per ear. Unlike other mobile establishments, someone actually emerges from the truck to take your order while you sit and enjoy the ambiance of chriping birds, and the purple silk potted flowers that attempt to beautify the tables. Most shrimp enterprises feature some type of awning apparatus over wooden or plastic picnic tables adjacent to their trucks. Fumi’s goes a step further and offers a sink station to wash your hands after your sticky meal. You order the shrimp scampi and savor all the bits of stir fried garlic and thank the heavens for the chef who took the time to drizzle every bit of sauce from the pan. Each bite of shrimp is the sweetest, plumpest morsel that has ever graced your mouth. Want to duplicate the shrimp scampi experience at home? Saute olive oil, a splash of white wine, ten cloves of minced garlic and some paprika on low heat. Fire it up when you add the shrimp and cook it until its tender. Serve on a paper plate, play some Hawaiian reggae music and throw in some wild chickens for atmosphere. Website: None, its way too authentic. Location: One mile up on Kamehameha Highway from Turtle Bay Resort, Oahu.